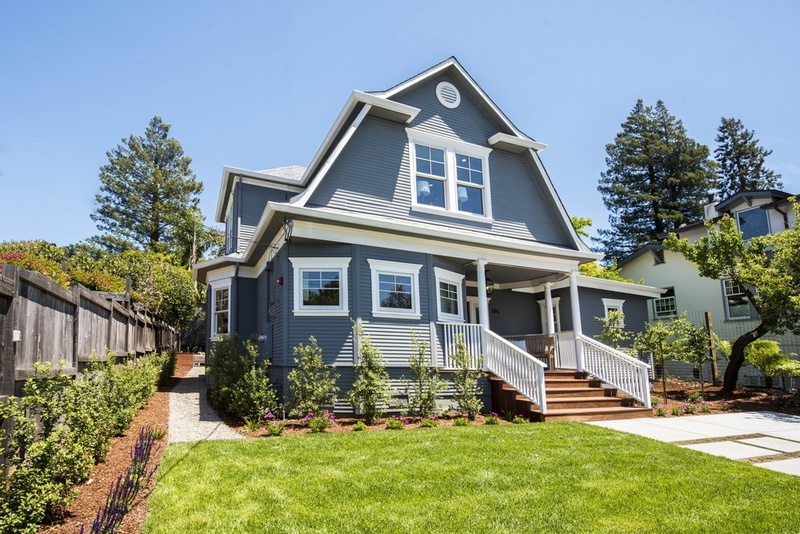 Located on one of the most sought-after streets in Mill Valley’s most sought-after neighborhood, 106 Locust is surrounded by big, beautiful homes on a picturesque tree-lined avenue. 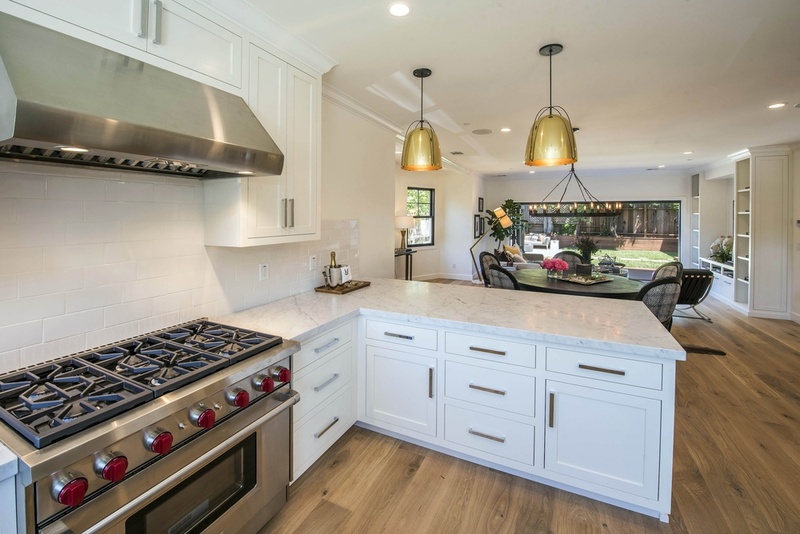 An extensive remodel completed in 2016, this contemporary Cape Cod-style home rests in the heart of Sycamore/Tamalpais Park and features 5 bedrooms, 4.5 bathrooms and 2,519+- square feet of living space filled with designer finishes and an ideal floor plan designed for all stages of life. With a traditional shell and a contemporary interior, this beautiful home effortlessly blends today’s entertaining lifestyle with the comfort of the past’s homey layout. A large front yard with custom concrete pads leads to the charming Ipe front porch with wide steps. The front of the property sets the perfect scene for kids to play and enjoy a picnic on a warm day. Walking through the front door you are greeted by an ideal open floor plan with high ceilings, custom inset cabinetry, wood windows, wide-plank European white oak floors, large windows and bi-folding doors that seamlessly connect the great room to the level backyard. Tucked behind the built-in entertainment wall is the lower level powder and laundry rooms. 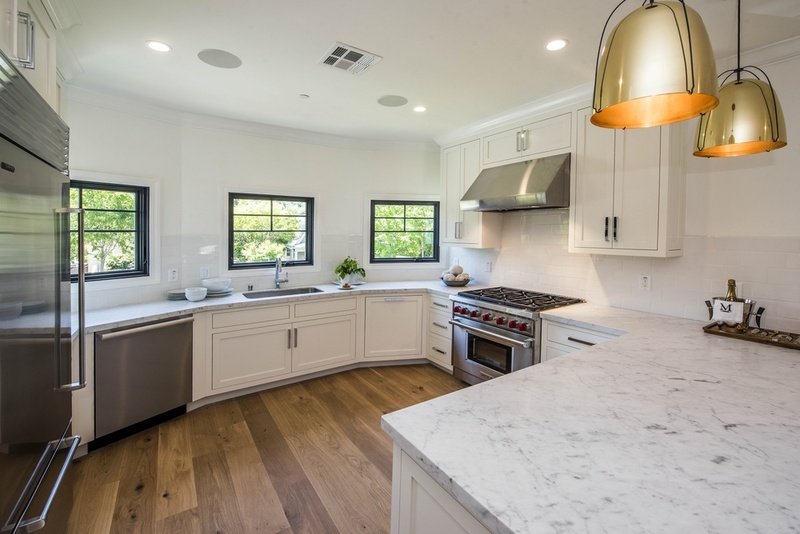 The stunning chef’s kitchen features top-of-the-line finishes and stainless steel appliances, including Carrara marble countertops, custom soft-close cabinetry, a Sub-zero refrigerator, a 6-burner Wolf range and a Miele dishwasher. The built-in bar seating with striking gold pendant lights makes this kitchen perfect for casual dining, cooking and entertaining. 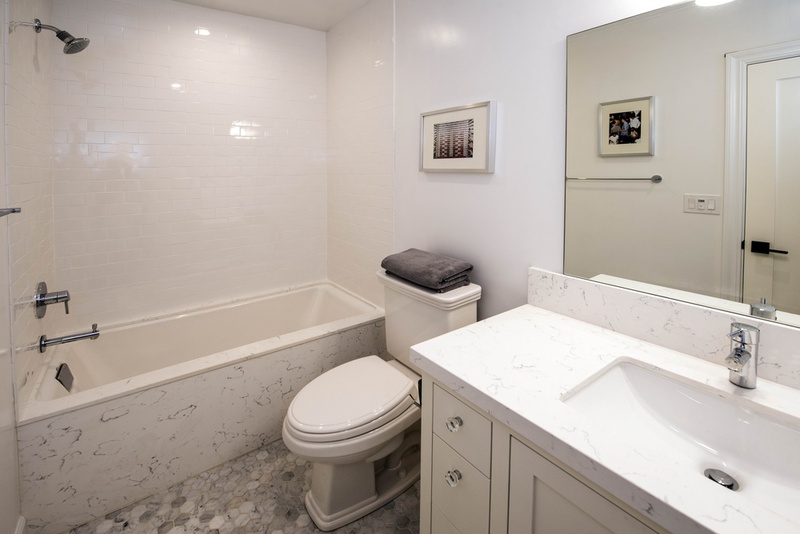 Also on the main level is a full guest suite with a large full bathroom. This room is ideal for using as a guest suite or a media/play room. The upper level of the home features a beautiful master suite and two large guest bedrooms divided by a central guest bathroom for kids, teens and/or guests to share. Near the guest bedrooms but located in its own private wing, the master suite enjoys large windows framing in the unobstructed views of Mt. Tam and the private backyard. 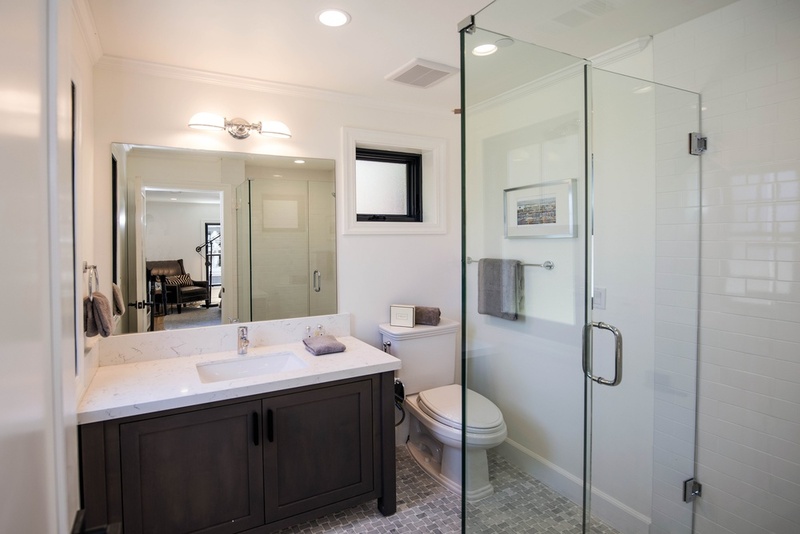 A spa-like master bathroom pampers the owner with a large walk-in shower, a soaking tub, a double vanity and a separate washroom. The shower is completed with Carrara marble tiles perfectly set in a beautiful chevron pattern. Large in size, each guest bedroom features big windows, walk-in closets, ample storage and beautiful views of the surrounding hills and Mt. Tam. Through the large bi-folding doors in the family room is a sunny, private backyard with features that will satisfy the most discriminating buyer. You are greeted by a beautiful Ipe deck with just one little step down to a level lawn and a lounge area complete with a gas fire pit providing the perfect setting to relax, barbeque and entertain. Attached to the home but accessed from the backyard is an au-pair suite complete with its own private entrance, large windows, a full bathroom and a walk-in closet. 106 Locust is ideally located in best location on the best street in the most sought-after neighborhood in all of Mill Valley. It doesn’t get any better than this! Enjoy everything the flats of Mill Valley has to offer while safely sited above the flood zone. This ideal property is just moments away from award-winning schools, parks, vibrant Downtown Mill Valley, shops, restaurants, public transportation, Whole Foods, world-class hiking + biking trails and so much more. 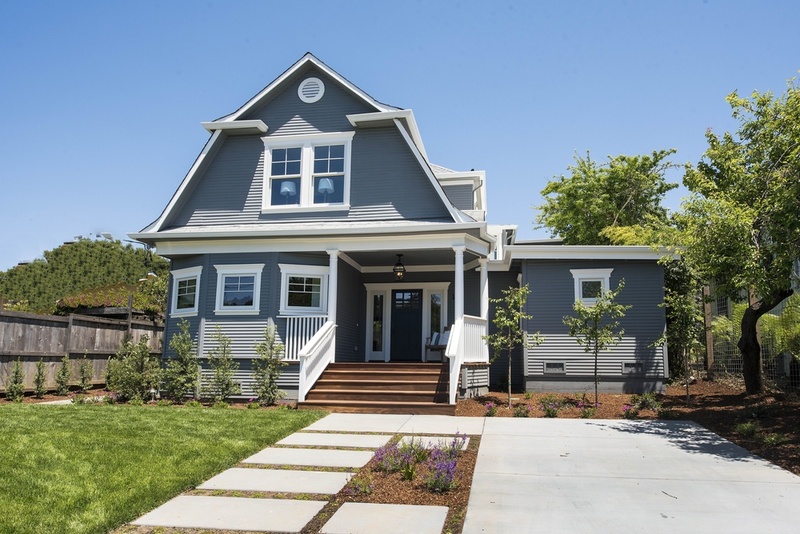 106 Locust is the epitome of why Sycamore/Tamalpais Park continues to be the premier neighborhood in Marin County.